meeting.knet.ca - This website provides an online bridge where people from First Nations communities, universities, government, and other groups converge to learn, share and engage in discussion. Registration is open to the general public and members are able to create and administer their own Meeting Places. Registration is free. All are welcome. 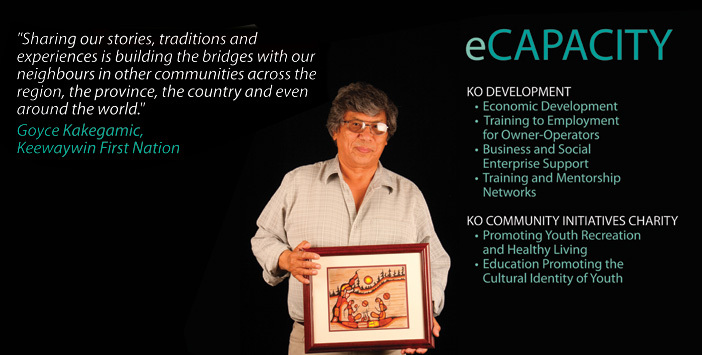 services.knet.ca - The Kuhkenah Network (K-Net) provides information and communication technologies (ICTs), telecommunication infrastructure and application support in First Nation communities across a vast, remote region of north-western Ontario as well as in other remote regions in Canada. This private telecommunications network supports the development of online applications that combine video, voice and data services requiring broadband and high-speed connectivity solutions. K-Net is a program of Keewaytinook Okimakanak (KO), a First Nations tribal council established by the leaderships of Deer Lake, Fort Severn, Keewaywin, McDowell Lake, North Spirit Lake and Poplar Hill bands to provide a variety of second level support services for their communities. Kuhkenah is an Oji-Cree term for everyone, everywhere. KO ecdev www.ecdev.knet.ca KO Community Initiatives is a charity promoting healthy living and culturally-based education through land-based recreation opportunities for First Nation youth. KO Ecdev works with EDOs, community groups, entrepreneurs and community members to increase the number and quality of jobs, build capacity through training and increase social enterprise activity. communities.knet.ca - Interactive map with First Nation Communities in Ontario. myknet.org - Allow for free access to a personal homepage for community members.